How smooth a product do you want? Do you mind "taking your lumps?" To mash potatoes, apples, carrots, bananas, yams or other foods, the cooking tool must be sturdy. Several companies make nylon tools that meet this criteria. Calphalon is one of them. Their "Complements Nylon Tool" is pictured here. The santoprene handle is comfortable and easy to grip. What I really like about this particular model is that the head is bowed so I can rock the tool back and forth. Round or oval heads are best to get to the sides of cookware. The handle is long enough to reach the bottom of most of my pans. This particular tool or one very similar to it is good for using with nonstick pans. 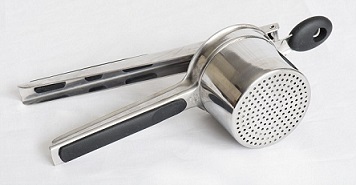 Calphalon also has their Complements Stainless-Steel Tool. The head is the same shape as the nylon model mentioned above but this model is a little longer (12-1/4 inches). The handle has a matte finish that improves the grip. This is NOT a tool to use with nonstick cookware. OXO is a company well-known for its ergonomically designed cooking tools. They make two such tools I really like, one with the square wire head and one with the round mesh head (my first choice). Both the OXO Good Grips 26291 Wire-Style Tool and the OXO Good Grips 1057942 i-Series Potato Mashing Tool and the OXO Good Grips 1057942 i-Series Potato Mashing Tool are pictured here to make several comparisons. The heads are different shapes and the handles are different. Some people prefer the long straight handle for easy "reach" into the cookware. Others like the "loop" handles because they can more easily apply downward pressure. These are basic examples of this tool on the market today. As you do your own research you'll discover some minor variations on the basic components discussed here. If you buy any one of the tools shown on this page, it should last a very, very long time. Any of these tools will do a good job but you'll do a little "work" to get all the lumps out. There is another tool you could use if you want to make certain your potatoes (or other) are very smooth ...use a ricer or at least consider one. Instead of explaining a ricer (shape, size) and how to use one, I have posted two videos. Watch them both as each one demonstrates a different ricer.